Sebakwe Dam the second largest dam in Southern Rhodesia completed 1957. Monitoring progress. Climbing the dam wall in 1956. Height 154 feet high (47 meters). David Hirsch, Wendy Allen, Michael Lannon (of Johannesburg), Brian Hirsch, Diana Hirsch. I was afraid of heights (still am). A Contribution Not Etched In Stone. Water was a precious commodity in Rhodesia but Que Que district had several rivers. The challenge was to bring the water to the town so that it did not go thirsty in its long dry spell over the winter and well on into the heat of October before the rains came. In 1946, our house, along with Phoenix House, the mine managers residence, were the only two houses that had indoor Elsan toilets. Everyone in Que Que wanted an end to the hodge-podge of septic tanks and the honey suckle bucket brigade. Dad considered it a public health must. The town was dependent on water from the Kwe Kwe River, named for the sound the local frogs make. It was a small river, only fifty miles long, emptying into the Sebakwe River. It had seven small dams on it along the way. The main dam was at Cactus Poort, where a good catch of bream could always be assured. Good afternoon breezes secured it as the home of the Que Que Sailing Club. The commodore for a number of years was John Adlington, one of Dad’s medical partners. A new water supply from Cactus Poort to the town had been installed shortly before our arrival in 1946. Everyone knew this supply could not be augmented. The engineering consultants from Johannesburg , Stewart, Sviredov and Oliver had declared it to be the cheapest solution to the town’s needs and that it would be adequate for many years to come. Dad thought otherwise. A water-borne sewage system would soon tax our water supply, what with the post war industrial growth coming with RISCO (Rhodesian Iron and Steel Works) expansion and Union Carbide’s Ferrochrome plant. A nitrogen fertilizer project based on nitrogen fixation from the atmosphere was also in the offing, amongst other things. The farming riparian rights also needed to be assured for the major irrigation projects being developed. The feasibility study of Dutchmans Pool Dam six miles north east of Que Que on the Sebakwe River was finally approved. Again, the prestigious firm of Stewart, Sviredov and Oliver were the consulting engineers. The family knew something was up when we all piled into the car and headed out one Sunday. It did not happen often. We would not be relaxing somewhere along a river-bank, fishing pole in hand. Along for the ride was an engineer from RISCOM with a roll of survey maps under his arm. Dad had on his army boots and his army canteen on his belt. We were going on a long walk. The thermos of tea, sandwiches and rusks Mom had brought along would come later, “after we had earned it”. We followed the river through sometimes dense bush, climbed up and down, back and forth over and between the kloofs and kranzes. It was hot and thirsty work. Dad contested Mr. Oliver’s site which made the pipeline access and filtration plant significantly more costly and would take longer to construct than a much more suitable point a quarter of a mile down river. He was convinced of it. “How dare you, a doctor of all people, challenge my professionalism!” Mr. Oliver threatened to resign. The council appealed to him to make allowances for over enthusiasm. The town engineer, who actually agreed with Dad, dared not express his opinion. Dad never conceded. 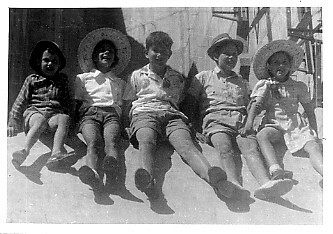 The photograph shows the family and friends sitting on the dam wall of the much bigger Sebakwe Dam, also part of the scheme, which was completed in 1957. It was the second largest dam in the country at the time, covering an area of 9 square miles (2320 ha) with a capacity of 35 billion imperial gallons. It had been an uphill battle all the way to bring it about. A national park was established around Sebakwe Dam. I see you have your friend Wendy along….you guys look so hot and thirsty!! It seems that there was a major struggle and battle fought for every single amenity. Living was tough and your dad seemed to be always “full steam ahead” Interesting that he had better insight than almost every other professional around. You must have always been challenged to do better and excel , Diana…..did you ever feel pressure or feel like you had to live up to his expectations? He was a true powerhouse and deserved to be mayor. I am sure the city truly appreciated his efforts toward all the improvements! Wendy was my best friend dating back before Kindergarten and we are still in touch. Hot! It was the Christmas School holidays (6 week break before the new school year began) and Michael, came to stay from Johannesburg. His father Josh Lannon was the premier surgeon in SA and Dad used to assist him for a week each year to stay up with the latest advances. The town of Que Que was an appendage to the Globe and Phoenix Mine. In the beginning the mine supplied all the amenities to the town…water, electricity etc. Nobody believed a town of any significance would arise from it and it was an uphill battle to convince anyone otherwise. Then people were keen until they realized improvement would necessitate rates going up which would affect there pockets, especially the councilmen who were the big land and business owners with the deepest pockets. Sound familiar? He found ingenious ways to do the financing…another story. No my Dad didn’t have expectations for us. We were free to choose. He had wanted to be an atomic physicist but his father (remember he was Jewish from the Pale of Lithuania in the time of the Pogroms) insisted on medicine for job security. He always resented this parental control over his life. I am really enjoying these trips down memory lane. The road sign by the riverbank near Que Que says the stream and town’s name derive from kwe-kwe – the noise that the frogs make. Others say, however, that in the early days both Mzilikazi and Lobengula had cattle posts in this district and, as a result of rinderpest and scab which wiped out most of the beasts, the area became known as ilizwe lwesikwekwe – the country of the scab or mange. Isikwekwe has evolved to the truncated from kwekwe. Well, I do like the frog origin better, although it lacks romance. This other origin I havent heard before, but does make sense. The Globe and Phoenix Mine development was delayed with the outbreak of the Second Matabele uprising and the outbreak of rinderpest in 1896. The avent of rail to Bulawayo in 1987 got the machinery that far, but it wasn’t until 1900 that the 40 stamp mill came into operation. It really was the country of the “scab and the mange”! Ed, thanks for persevering on the comment. You always have something special to contribute. Thank you for a wonderful blog. I have been trying to find information for my thesis on the history of the Sebakwe area but it has been difficult. Do you have any links I could follow that could help me with this?